Hey folks, I recently got into keycap making. I've been getting a lot of issues with air bubbles so I purchased a 2.5g pressure pot for resin casting. I tried searching the internet for a compatible air compressor, but most advice is geared towards air compressors for the use of power tools/painting. My understanding is that 100psi should be sufficient and that the only other spec that really matters is HP (where HP is related to the time it would take to reach a certain PSI). Is this sufficient to compress the air in my 2.5g pressure pot to ~50psi? Actually, the HP rating is almost irrelevant - you want a sufficient CFM rating and/or tank capacity. You'll generally be casting at around 60PSI but that flow rate seems very low. 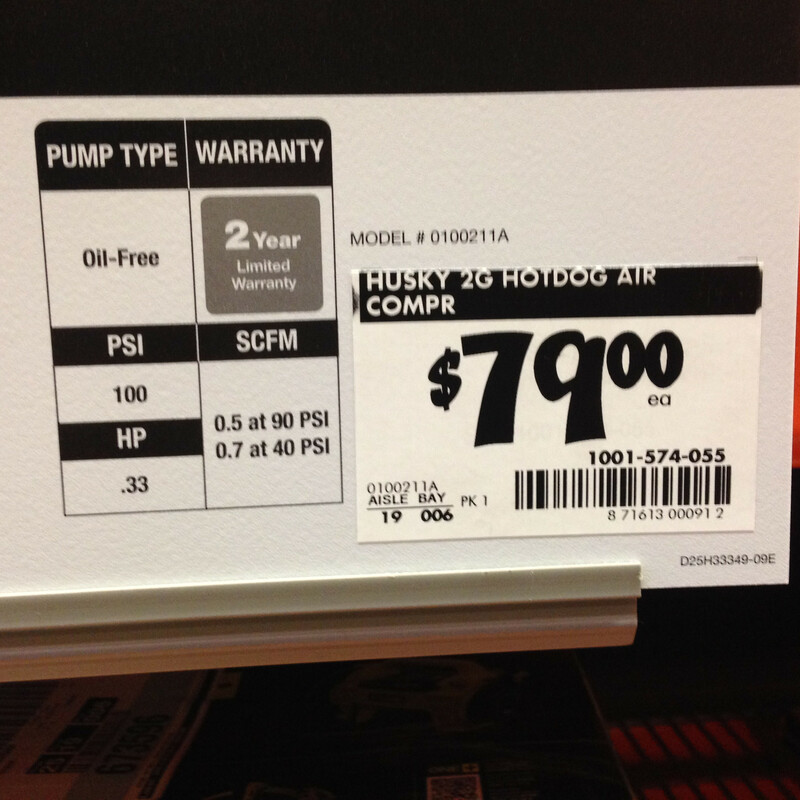 That label you've taken a photo of really isn't informative enough but if it's anything like what comes up when you google "husky 2g hot dog air compressor" then the tank is far too small. The horsepower does indeed relate to how long it will take to reach a certain PSI, but without a large motor it will take too long to pressurise your pressure pot. What you want to happen is the compressor motor fill a decent size tank with air, which can then be transferred very quickly to your pressure pot by opening a valve. That way it doesn't matter how long it takes the compressor to fill the air tank and the horsepower rating is unimportant. you want the compressor tank size to be larger than your pressure pot size. Also, since people typically cast indoors, you may want to take a quick look at the db rating as air compressors can be very loud and annoying to stand next to. I'm looking around for a quieter one as i do more and more casting. Thanks for the feedback, guys. I went ahead and returned the pot. I am going to order this 5.5 gallon air compressor (https://www.amazon.com/gp/product/B00NOSCDPA/) on Amazon. This should fill up my 2.5g tank without having to run multiple times. I am running this in my apartment so it looks like this should be quiet enough! The air compressor works like a charm. Quiet and quick! Do you guys know if 50 psi is sufficient for casting objects the size of keyboard caps? I've read somewhere that 40-60psi should work just fine. I just picked up a 40 litre 12 bar Jun-Air compressor (2xOF302) second hand. Runs at just 62 dB - a vast improvement on my previous 25 litre 8 bar, running at 97 dB! Fleafa wrote: I just picked up a 40 litre 12 bar Jun-Air compressor (2xOF302) second hand. Runs at just 62 dB - a vast improvement on my previous 25 litre 8 bar, running at 97 dB! 30dB makes a huge difference. I am running this in my apartment and my roommates didn't even know! Yeah, my airbrush runs off a reclaimed refrigeration compressor which is super quiet, but the .5CFM is too slow for my casting purposes. The 97 dB one does about 9 CFM, the new one manages only 2.68, but the 40litre tank offsets that drawback. It is still loud when stood next to it, but now I won't annoy the neighbours! Fleafa wrote: Yeah, my airbrush runs off a reclaimed refrigeration compressor which is super quiet, but the .5CFM is too slow for my casting purposes. The 97 dB one does about 9 CFM, the new one manages only 2.68, but the 40litre tank offsets that drawback. It is still loud when stood next to it, but now I won't annoy the neighbours! I have only worked with resin/molding mix that have a pot life of 30 minutes. That is more than enough time for me to mix everything together and throw into the pot and start the compressor. Is there a reason you guys are using resin that have a much shorter pot life? For me, it is to maximise the number of casts per day. My current resin has a pot life of 7 mins, though in winter I use one with a 3 min pot life. Fleafa wrote: For me, it is to maximise the number of casts per day. My current resin has a pot life of 7 mins, though in winter I use one with a 3 min pot life. I just purchased some Alumilite since it has a 15 min cure time. I thought I had to wait days for a casting. This is great! For information, I use Smooth-On's Smooth-Cast 300 range. Great resins, but you pay a premium for them.